The Palestinian artist received one of the main awards of the 52nd Venice Biennial. On 17 October 2007, the International Jury of the Venice Biennale's 52nd International Art Exhibition assigned four Golden Lions and two Honourable Mentions. The jury was formed by Manuel J. Borja-Villel (president), Iwona Blazwick, Ilaria Bonacossa, Abdellah Karroum, and José Roca. The Golden Lion to an artist under 40 years, exhibited in the central international exhibition or in the national participations, was awarded to Emily Jacir. According to the jury: "The award for an artist under 40 is given for a practice that takes as its subject exile in general and the Palestinian issue in particular. Without recourse to exoticism, the work on display in the central Pavilion at the Giardini establishes and expands a crossover between cinema, archival documentation, narrative and sound." On Monday October 16, 1972, Wael Zuaiter left Janet Venn-Brown's apartment and headed to his apartment at No. 4 Piazza Annibaliano in Rome. He had been reading A Thousand and One Nights on Janet's couch searching for references to use in an article he was planning to write that evening. He took two buses to get from Janet's place to his in northern Rome. Just as he reached the elevator inside the entrance to the building of the apartment block where he lived, Israeli assassins fired 12 bullets into his head and chest with 22 calibre pistols at close range. Wael Zuaiter had become the first victim in Europe of a series of assassinations committed by Israeli agents on Palestinian artists, intellectuals and diplomats that was already underway in the Middle East. A thirteenth bullet pierced his volume 2 of A Thousand and One Nights and got lodged in its spine. 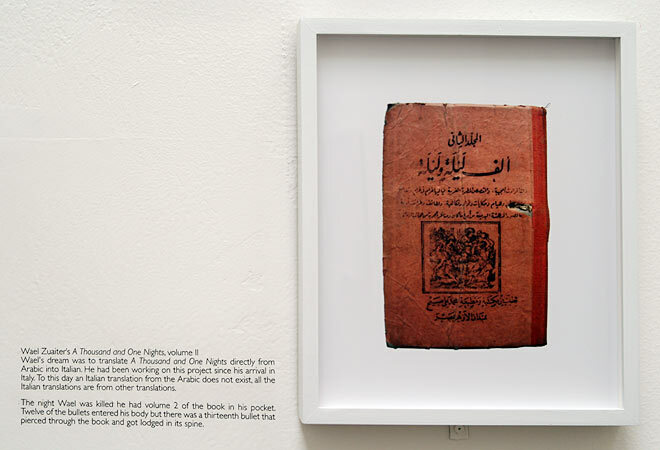 One of Wael's dreams was to translate A Thousand and One Nights directly from Arabic into Italian. He had been working on this project since his arrival in Italy in 1962. To this day an Italian translation from the Arabic does not exist. In 1979, Wael Zuaiter's companion of eight years, Sydney-born artist Janet Venn-Brown published For A Palestinian - A Memorial to Wael Zuaiter. One chapter, titled Material for a Film by Elio Petri and Ugo Pirro, consists of a series of interviews conducted with the people who were part of Wael's life in Italy, including Janet herself. They were going to make a film, but Elio Petri died shortly afterwards and the film was never made. Her dOCUMENTA (13) project about the Palestinian books looted by Israel in 1948, and kept in the Jewish National Library Jerusalem.